Bob Nightengale covers the MLB for USA Today and the MLB Network. 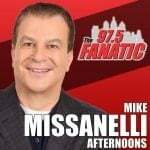 He joined Anthony and Jason today to talk about his story where he said that Bryce Harper will be a member of the Phillies by the start of next season. Check out the interview here!